I want to bounce. And by bounce, I mean, bounce—soaring high in the air, my legs in what I imagine is a glorious stag-leap, my stomach dropping a little as I descend. But unfortunately that’s not on the agenda for this class, known as Bounce, at DEFINE fitness studio in Buckhead. I get it. It wouldn’t be safe, given that I’m one of about a dozen people on individual mini-trampolines that are only a few feet apart from each other. And the idea of this 45-minute workout is to get your heart pumping from something other than glee, which isn’t really possible if you’re averaging, say, eight big bounces every 20 seconds. With pop mixes and electronic dance music as the soundtrack in this small but sunny room at DEFINE (which also offers indoor cycling and barre classes), we bounce on both feet, one foot at a time, in a jumping jack, and with feet going in and out, forward and back, and side to side. We try to run in place as fast as we can. Our arms are up, or pressing in, or raising the roof, or simulating punches. Sometimes I feel like I’m trying to pat my head while rubbing my tummy. But I can’t help but smile because bouncing is just inherently silly. I’m laughing at myself and I’m working up a decent sweat; you engage your abdominals, legs, quads, and glutes in this kind of workout, which is said to burn 126 calories in a half-hour. 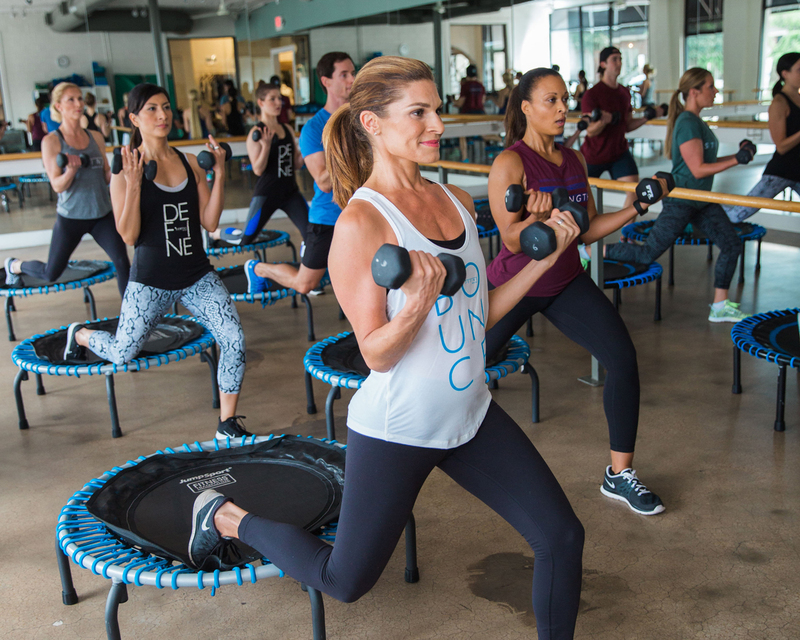 In DEFINE’s Bounce class, you’re not jumping for the entire 45 minutes. There’s also some upper-body work, like push-ups with your knees on the trampoline and your hands on the floor, as well as leg lifts, crunches, and upper-body moves with light weights. It feels like a solid full-body workout, and one that doesn’t jar your joints the way it might if you were jumping on the ground. And what fun is jumping on the cold, hard ground, anyway? None at all, as far as I’m concerned. It’s the springiness of the trampoline that makes this fitness class so entertaining, effective, and satisfying—even if you don’t get the chance to spring into the stratosphere.